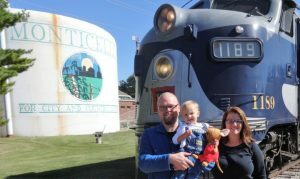 Tara Allen and her family at the Monticello Railway. Photo provided. My daughter just turned 2 and has expressed an interest in trains, primarily thanks to books and Grampy pig’s ‘miniature locomotive’ on her TV obsession, “Peppa Pig.” I thought we should check out the trains at the Monticello Railway Museum and go for a ride. I booked tickets online thinking I would save myself some time but, once there, I found myself in line like everyone else. The cashier confirmed my online purchase and handed over paper tickets that would be punched on the train which adds to the nostalgic essence of the experience. We only have one child but manage to be late just about everywhere we go. The train leaves promptly on time so there is no room for tardiness. We, miraculously, arrived early and had plenty of time to get our tickets and take some photos before boarding the train. Once we boarded a passenger car, we decided that the caboose would be way cooler so we hopped off and headed down the platform to climb aboard. The caboose is pretty bare bones. All seats are singles so we were unable to sit as a family. We decided to ditch the caboose and head back to the passenger car. As we descend the stairs, I notice that the platform is completely empty and am a little alarmed that we have officially run out of time. I may or may not have let an expletive fly as I urged my little family back up into the caboose. We heard a TOOT! TOOT! and the train started to move as soon as we hopped back on (which raised an eyebrow from us regarding safety checks) but all ended well. Although it is far from fancy, we thoroughly enjoyed our ride. The caboose comes with its own amazing view and informational crewman who educated us that one toot means the train is stopping and two toots means that it is going. In preparation for this venture, I loaded my backpack with activities, back-up activities, books and lovies in case my little one did not think this train ride was nearly as cool as her parents did. I looked like I was heading out for a camping expedition. My kiddo was SO into this train ride that I needed only the water cup and fruit snacks and that wasn’t until the return trip. She thought the ride in the caboose, facing the RR with the wind blowing in her hair, was fantastic. The perfect fall day added to the experience. I noticed that a vintage train is kind of noisy but this didn’t seem to bother her at all, despite her normal toddler fear of the vacuum and other loud noises. She sat in my husband’s lap and murmured “choo chooooo” the whole ride. After 20-25 minutes riding through Monticello, the train pulls into Wabash Depot in downtown Monticello. The conductor announces that we have 10 minutes before our train boards and heads back to our point of origin but we are welcome to stay for 90 minutes or even three hours and return on a later train. We only stayed for 10 minutes because, you know, 2 year old in tow. We had plenty of time to take photos in front of the gorgeous diesel engine. The depot is small but stocked with a toy train table set and full of vintage treasures from telegraph machines to antique phones and signage. There weren’t any “Do Not Touch” signs so we assumed it was a hands-on exhibit and went to town dialing antique phones and pushing random buttons. Note: There is a restroom located within the depot. For our return trip, we sat in a restored passenger car. In this car, we were able to sit as a family and chat. I, for one, loved the fact that my husband was a captive audience (bahahahaha). We sat beside a gorgeous wooden window, which was open and a small, unsupervised child could easily squeeze through (insert eyebrow raise regarding safety). I assume we could have closed the window or chosen another seat with a closed window. Be aware that you will be responsible for the safety of your littles. There is no hand-holding, warning or double checking from the all volunteer crew so bring your own back-up or have a chat with your kids before boarding. Upon returning to our station of origin, I immediately returned to the station gift shop and grabbed an adorable pink engineer cap for my girl as a souvenir of the day. It was reasonably priced at $9. The gift shop has loads of cute train gifts from books to whistles. They even carry old-fashioned refrigerated bottles of Sasparilla and Cherrywine sodas. Once I had secured the hat, I met my family in the display cars. We were able to walk through and see roomettes, sleeper cars, dining cars and more. It is a great way to experience a little slice of history for all levels of interest and ages. There are historical facts displayed throughout with some longer pieces of literature here and there for the more mature train buff. For children or those that are less interested, a brief walk-through is a valuable and entertaining experience. My tot loved the old typewriter set up on a table. I made the decision to book this train ride on a whim and I am so glad that I did. It was a brilliant way to spend a gorgeous fall Saturday and the length of the train ride was perfect! Before leaving, we had already made plans to return with my in-laws before the end of the month. If you would like to book your own tickets or learn more, visit the Monticello Railway Museum website. See why we think the Monticello Railway Museum is a CU Essential here. For more train watching around Champaign-Urbana and Beyond, see this post. Tara Allen is a creator of Mahomet Tots playgroup, RN on hiatus, and deliriously happy SAHM who enjoys photography, reading, play dates and adult conversation.